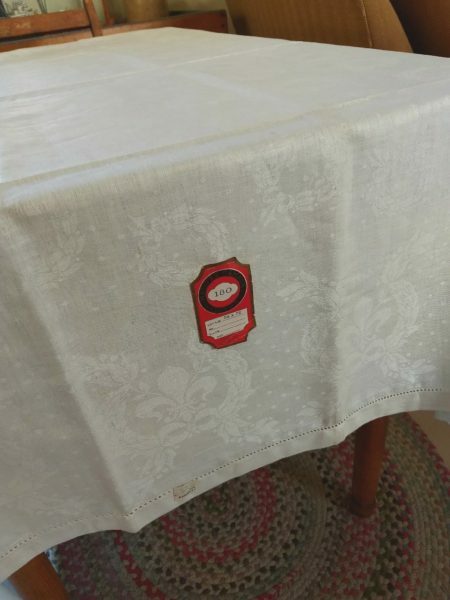 Unused, never laundered, a vintage late 1920’s or 1930’s cotton damask tablecloth. The pattern style is an all over wreaths, with a border of Fleur de Lis. A narrow edge of hem stitching at the hem line. Pretty wreaths, with bows, which could be suitable for a Christmas decor. If you need something nice in white for Christmas entertaining, this may be just the ticket. Reasonable priced, too.